Welcome to the Channel Islands National Park Information Page. The islands within the park extend along the southern California coast from Point Conception near Santa Barbara to just north of Los Angeles. Park headquarters and visitor center are located in the city of Ventura. The closest major airport is Los Angeles International Airport which is 70 miles South of the park. Take the Seaward exit left onto Harbor Boulevard, proceed on Harbor to Spinnaker Drive, turn right. The visitor center is located at the very end of Spinnaker Drive in the Ventura Harbor. Ventura is serviced by Amtrack, Greyhound, and airport shuttle services from the Santa Barbara and Los Angeles International Airports. Oxnard Airport has scheduled commuter service. Island Packers, 1867 Spinnaker Drive, Ventura, California 93001. Phone: 805-642-1393. The Channel Islands, an island chain lying just off California’s southern coast, appear quite close on clear days. Five of the eight islands and their surrounding one nautical mile of ocean, with its kelp forests. comprise Channel Islands National Park. 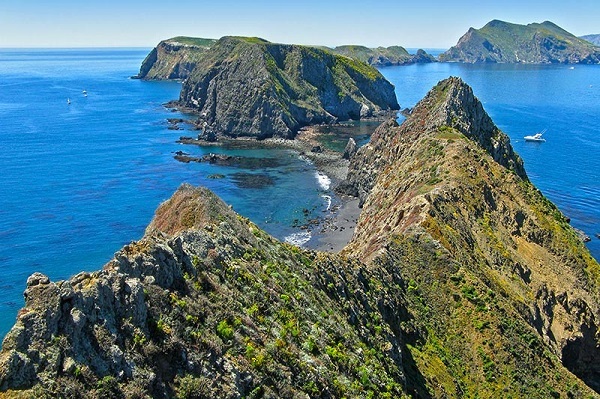 In 1980, Congress designated Anacapa, San Miguel, Santa Barbara, Santa Cruz and Santa Rosa Islands and 125,000 acres of submerged lands as a national park because they possess unique natural and cultural resources. Annual visitation to the park’s mainland visitor center is 300,000. Visitation to the islands and waters is low, with about 30,000 visitors traveling to the islands, and another 60,000 who go only into park waters. Although most visitation occurs in the summer, migrating gray whales and spectacular wildflower displays attract visitors in the winter and spring. Autumn is an excellent time to travel to the park, as well as for diving, as the days are usually sunny, with minimal winds and clear ocean water. Archeological and cultural resources span a period of more than 10,000 years. First came the seafaring Indians; then the explorers, fur traders, adventurers, and settlers; finally the scientists and sightseers of today. Seafaring Indians plied the Santa Barbara Channel in swift, seaworthy canoes called “tomols”. The Chumash or “island people” had villages on the northern islands and traded with the mainland Indians. The Gabrielino people lived on the southern island of Santa Barbara. The mainland visitor center is fully accessible. Due to their isolation and transportation requirements, the islands are not readily accessible for individuals in wheelchairs or those with limited mobility. Efforts are underway to provide some wheelchair accessible areas on Santa Rosa Island via air transportation. Please call the park for information. Inform yourself about the park, its features, and safety concerns before visiting, by contacting the park for brochures, and the boat and air concessions for schedules. See the Address Page. Because of the time involved in traveling from the mainland to the islands, a full day is recommended to visit the park. Anacapa is a great island for your first visit; it is the closest island to the mainland (1.5 hour boat ride) and consists of dramatic, steep cliffs, with hundreds of sea birds and marine mammals. Snorkeling, kayaking, and diving are all excellent in the rich kelp beds around Anacapa. For a multi-day visit, Santa Rosa is a good destination. You can go to various parts of the island to explore canyons and beaches. For a feel of a wilderness experience, San Miguel, the furthest out from the mainland, may be your choice. The island often is fog-covered or very windy. Access to many areas on the island is limited due to fragility of the terrestrial and marine resources. Biking is not allowed in the park. Sea Kayaking Channel Islands National Park is a unique and rewarding way to experience this pristine marine environment. You will find solitude and splendor while paddling along the routes used by the first visitors to the islands. Reservations are required to camp at National Park Service campgrounds on San Miguel, Santa Rosa, Santa Cruz, Anacapa, and Santa Barbara Islands. Camping on the beaches on Santa Rosa Island is available for experienced kayakers and boaters on a seasonal basis. All campgrounds are equipped with picnic tables and pit toilets. Except at the Santa Rosa Island campground, water is not available at campgrounds and must be brought with you. No fires are permitted except in designated areas on eastern Santa Cruz Island (wood provided). There are no entrance fees to visit the park, and no permit fees for camping in National Park Service-operated campgrounds. A free permit is required to camp at National Park Service campgrounds on San Miguel, Santa Rosa, Santa Cruz, Anacapa, and Santa Barbara Islands. Camping on the beaches on Santa Rosa Island is available for experienced kayakers and boaters on a seasonal basis. A free permit is required of private boaters to hike beyond the beach areas on San Miguel and Santa Rosa Islands. For all permits, call: 805-658-5711. For private boaters’ permission to land on Santa Cruz Island, call The Nature Conservancy at: 805-964-7839. The islands have no stores or restaurants. You must bring all your own food and water. There is hiking on all of the islands. The islands have no overnight accommodations. Pets are not allowed on the islands. There are picnic areas on the islands. The Mainland Visitor Center features a museum, living tidepool exhibit, three-dimensional models of all the park islands, interactive touch-screen exhibit, a tower with telescopes for viewing the islands, picnic area overlooking the Ventura Harbor, a bookstore, and an outdoor native plant garden. Visitors will enjoy the 25 minute park movie, “A Treasure in the Sea”, throughout the day in the auditorium. Every Saturday and Sunday park rangers present free interpretive programs on the natural and cultural resources of the park. Throughout the week, other programs and school visits may be scheduled by calling the visitor center. All facilities are fully accessible. Every Saturday and Sunday several scheduled programs are offered. Programs include Tidepool Talk at 11:00 am and Recreating at Channel Islands National Park at 2:00 pm. At 3:00 pm, rangers offer programs that look in depth at a variety of topics about the park. Programs are free to the public. The Mainland Visitor Center is located at the very end of Spinnaker Drive in the Ventura Harbor. Provides the visitor with Interpretive programs, a movie about the park, tidepool display, native plant garden, bookstore and island exhibits. The facility is fully accessible and offers a picnic area overlooking the Ventura Harbor. There are also visitor centers on the islands of Anacapa and Santa Barbara. Memorial Day through Labor Day, 8:00 to 5:00 weekdays, 8:00 to 5:30 weekends. Labor Day through Memorial Day, 8:30 to 4:30 weekdays, 8:00 to 5:00 weekends. The visitor center is closed Thanksgiving and Christmas. Climate is mild, with little variation in temperature year round. However, be prepared for high winds, fog, and sea spray at any time. Visitors to the islands should dress in layers, with short and long pants, windbreaker, hat, sun screen, and waterproof outer clothing. Wear sturdy hiking shoes with non-slip soles. Although most visitation occurs in the summer, migrating gray whales and spectacular wildflower displays attract visitors in the winter and spring. Autumn is an excellent time to travel to the park, as well as for diving, as the days are usually sunny, with minimal winds and clear ocean water.